LEE COUNTY, Fla. -- Video just released by the Lee County Sheriff's Office shows the 2016 incident the resulted in the firing of the deputy for improper conduct. The dashcam video shows the incident from October 28th, 2016. Deputy Raymond Gallagher is seen conducting a traffic stop for reportedly speeding. After the SUV pulled off the road and stopped, Deputy Gallagher is seen approaching the vehicle with gun drawn and yelling at the driver, before opening the passenger door and grabbing the female driver. As he pulls the woman from the SUV, it begins rolling and dragging the woman, who was caught in her seat belt, until the deputy climbed in and stopped it. 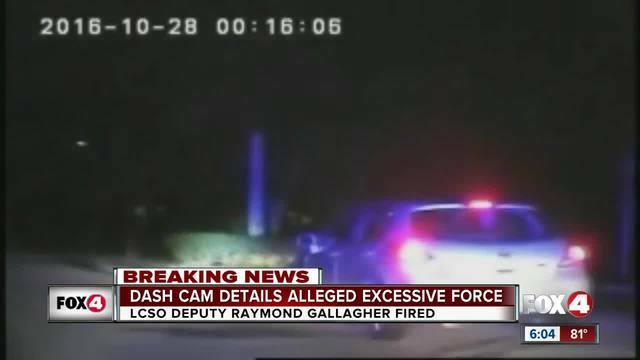 As we reported Wednesday , following an Internal Affairs investigation, Deputy Gallagher was fired for Excessive Force, Untruthfulness in Proceedings or Reports, and Conduct Unbecoming of an Officer.